Granite countertops installation in a kitchen or bathroom in your New Jersey home is possibly one of the best moves you can make when it comes to investing in your property. It isn’t always a simple fix, however. If you don’t have the right guidance, selecting and installing granite can be bewildering. 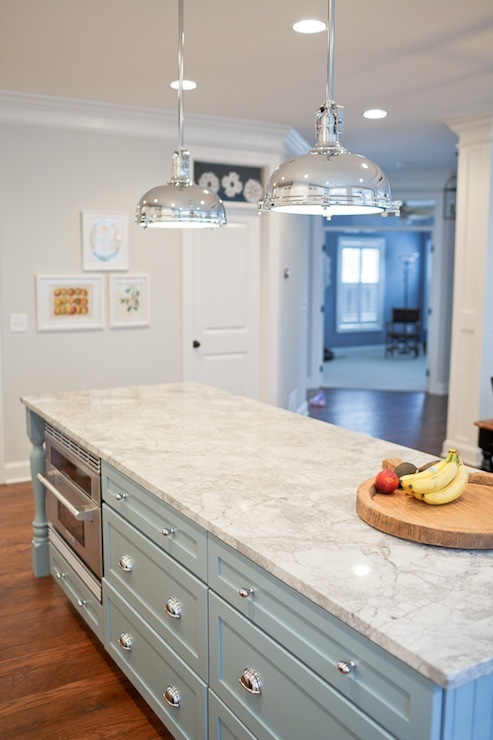 If you want to maximize your investment, there are a few things you should know before installing granite countertops in your home. Looking at all the pros and cons of granite countertops, there are definitely many more pros than cons. This is why we wish to go over cons first. The greatest weakness of granite countertops is that they last forever. When you choose the perfect slab and the best color, you will be happy with it. However, as granite is extremely durable, there won’t be the need to replace it – ever. That is why you may get tired of the color. It would be smart to look as far ahead into the future as possible and choose the color that you’ll always be happy with. It would be a shame to rip off the perfect countertop slab just because you don’t like the color anymore. Another possible granite countertops con is that each slab of granite is different. This is why it may not be a good choice if you prefer a completely uniform look. There is another possible problem with granite that can be avoided. It happens when granite kitchen countertops are not sealed correctly or the sealant wears off without the counters being resealed. Since granite as a stone is porous, it means that unsealed or poorly sealed granite countertops counters can absorb juice, oil, or wine. If they’re not properly sealed, there will be a stain that will be very hard or even impossible to remove. Another downside of poorly sealed granite counters is that it can harbor bacteria in its pores. Some treated granite counters can go even a decade without being resealed. However, the most granite countertop slabs will need to be resealed every year. This shouldn’t be forgotten or overlooked, in which case granite will start showing manifestations of staining. The safest option is to find an experienced and qualified installer who will seal your counter professionally. This way, your granite will keep its gorgeous looks indefinitely. Fortunately, there are immeasurably more pros than cons for granite countertops. 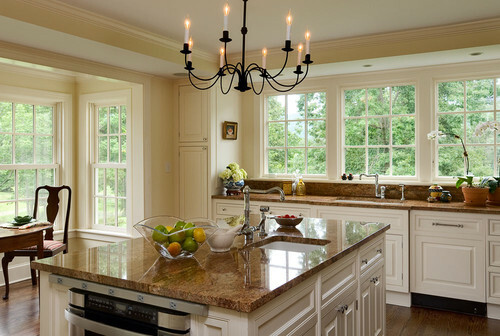 Granite countertops will preserve their value for a lifetime. Granite is a unique, natural stone with almost luminous appearance. 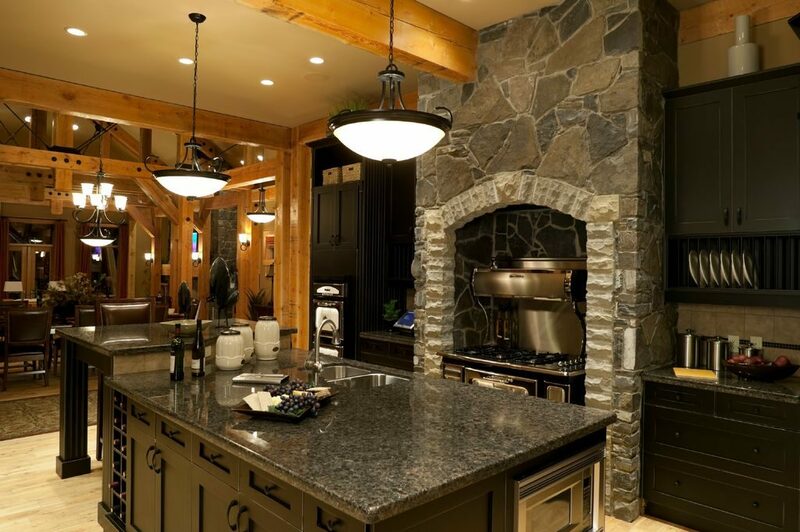 Without any doubt, granite is the type of stone that will add value to your home on many levels. Granite is hygienic and sanitary. 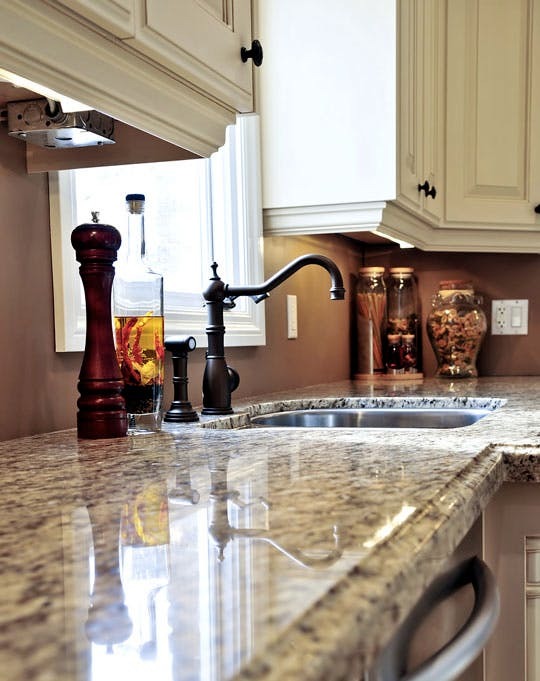 There is no fear of bacterial contamination with granite. Granite can take the heat. Hot pans and pots won’t be able to harm this stone so feel free to use it near a cooktop or range. Also, placing a hot pot or pan on granite is not a problem – it won’t be damaged in any way. However, it’s not advisable to expose any counters to the heat recklessly. As any other countertops, treat your granite with care, and it will last for many years to come. When it comes to cleaning your granite, simply use warm water and a mild detergent. This is more than enough to keep your counters clean, bacteria free, and beautifully looking. Granite is the type of stone that it’s not prone to scratches as it is a very strong, solid and tough material. Granite is so hard, that it will even dull your knife blades, so be careful while working on it. 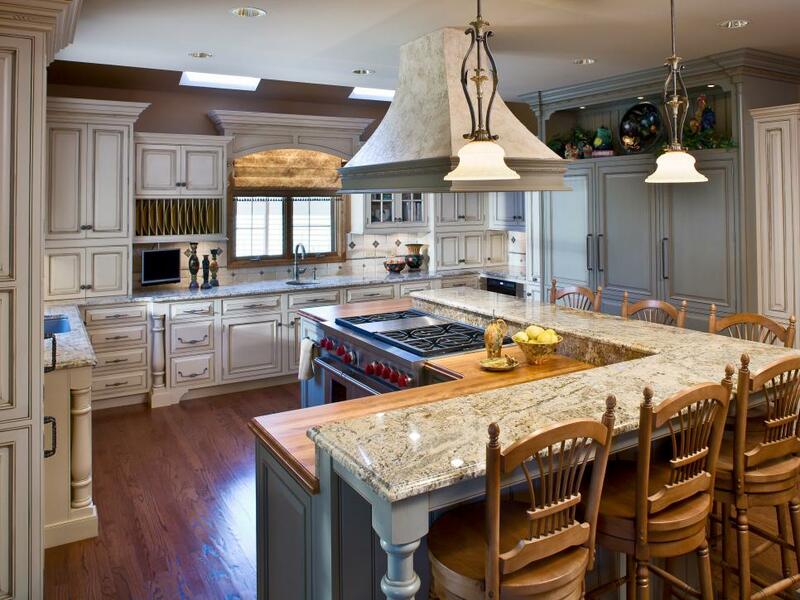 Granite countertops are, without any doubt, the most beautiful of all. Only a few other countertop types can meet this rich beauty granite has. However, their uniqueness is unreachable. 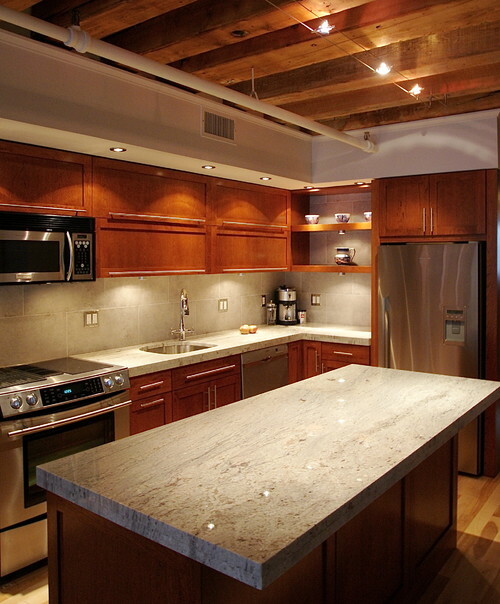 Granite countertops will give your kitchen the highest quality and take its style to the next level. 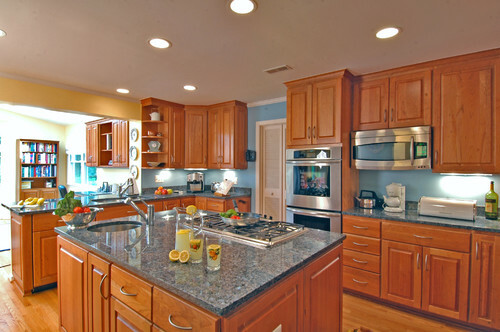 Undoubtedly, granite countertops will become the focal point and the very heart of your kitchen. There are many types, colors, and shades of granite. This is why it’s guaranteed to find the perfect combination for your kitchen cabinets, walls, and flooring. 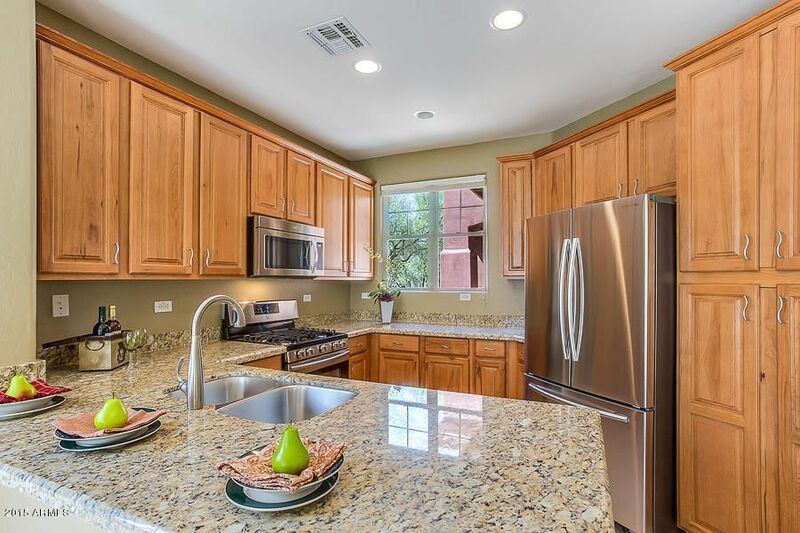 The most important thing to remember is to never clean your granite countertops with acidic or harsh cleaners like Windex, vinegar, lime or lemon, or anything that contains bleach or ammonia. Harsh cleaners will weaken and eventually break your sealant. Also, there is no need to use abrasive sponges and cloth. A soft, cotton cloth is perfect to use with warm water and mild soap or detergent. There are some special granite-safe cleaners. These are indeed safe to use on granite and they clean it well. Just know that you don’t need to spend extra money on them and that you don’t have to buy them if you don’t want to. 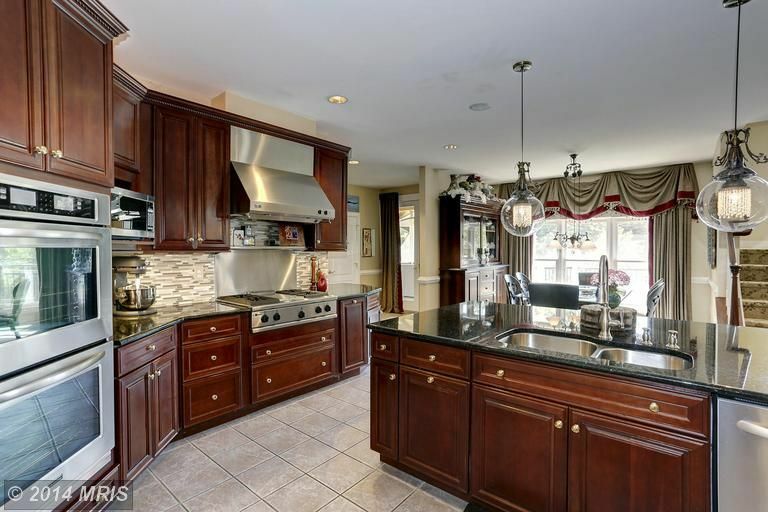 Granite countertops are becoming more and more popular in New Jersey. A trip to the showroom will give you the opportunity to examine samples in person. At Aqua Kitchen and Bath Design Center, we let our clients choose the exact slab from which their countertop will be fabricated. Many showrooms are not able to provide this one-stop shopping experience. Use this opportunity to find the perfect color match for your cabinets, floor type and color, as well as for the colors of your kitchen walls. If you wish to complement your white cabinets with blue shades and give your kitchen popular coastal look, take a look at blue granite. Thanks to luminous pearls running through it, Blue Pearl Granite is elegant and expensively looking. 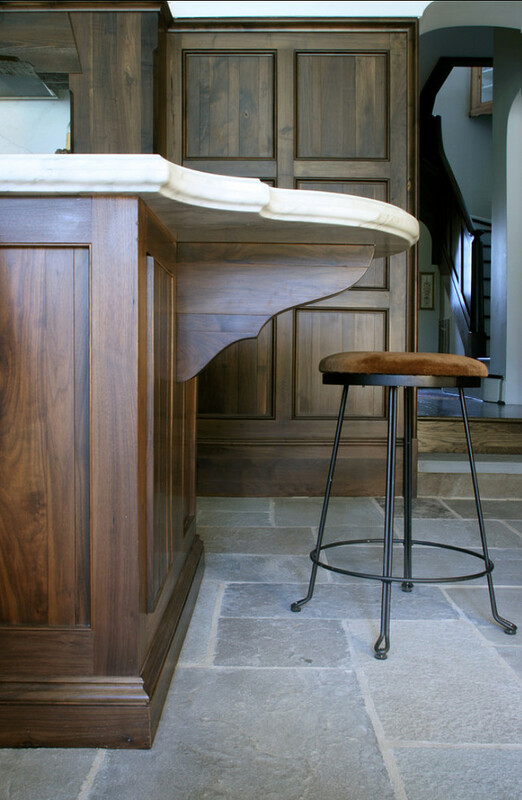 Take a piece of the stone to your home and see how it looks in your kitchen. Depending on how the light illuminates, it can be seen as a dark blue to a dark blue-gray color. Take a look at the Blue Pearl Granite Project we completed in Wayne, NJ. If you believe that this type of blue granite can be a good choice for your kitchen, take a look at the Blue Pearl Granite deal we’re offering right now. If your kitchen needs more brightness and more pattern, then Giallo Fiorito Granite is the perfect choice for you. Giallo Fiorito is multicolored, but mostly brown granite countertop. It is textured and patterned stone with beige, medium to strong brown, black and gold veins and speckles. Find Giallo Fiorito Granite in our slab yard at only $39,99 per sq ft. Choosing granite countertop colors won’t be a hard task to complete when you know what color you prefer. Gray is an option that is often overlooked but can be the perfect choice and a real kitchen look saver. Steel Gray Granite will provide an amazing contrast to light color kitchen cabinets and luxurious feel to the whole space. Take a look at the Steel Gray Granite Project we completed in Woodridge, NJ. Find Steel Gray Granite in our slab yard at only $44,99 per sq ft.
One of the most interesting dark granite countertops is Uba Tuba Granite. Some people consider it a black granite countertop but it’s actually a deep green granite. Take a look at Uba Tuba Granite Project we completed in Kinnelon, NJ. 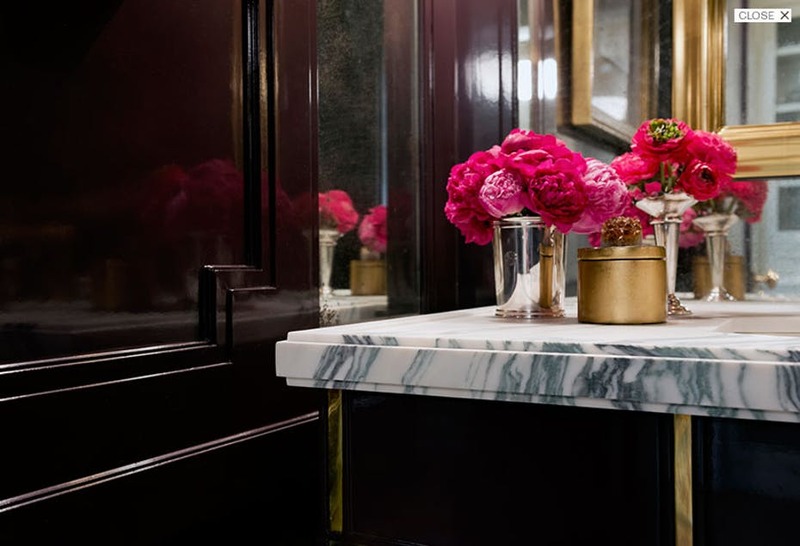 Find Uba Tuba Granite in our slab yard at only $39,99 per sq ft.
One of the most popular granite countertops colors is bordeaux with its elegant and mysterious burgundy color. 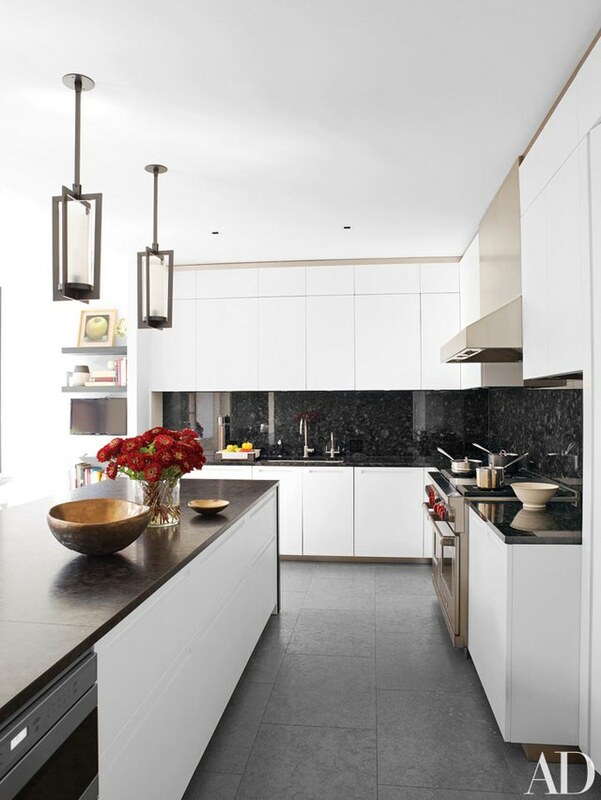 Typhoon Bordeaux Granite is equally attractive for both light and dark kitchens. Its golden shine will give a touch of glamor to your kitchen. 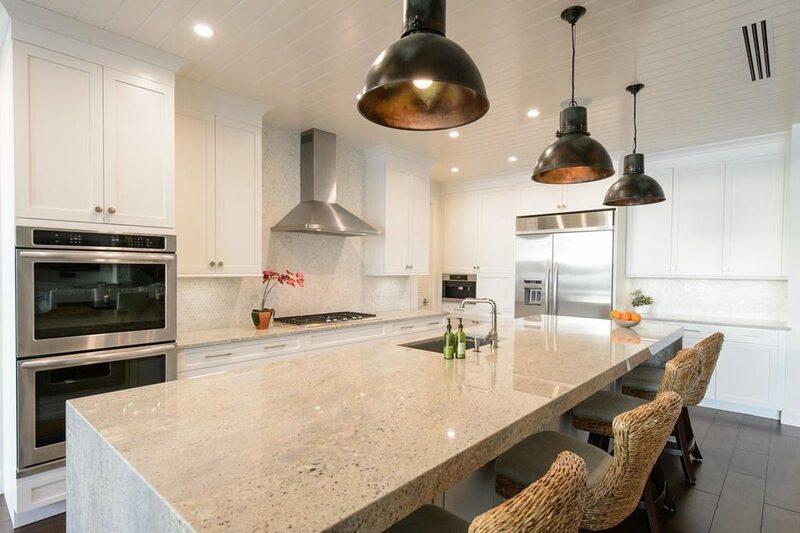 Find Typhoon Bordeaux Granite in our slab yard at only $54,99 per sq ft.
Black granite countertops are very popular as they present the perfect combination for ever-popular white kitchens but also a simple solution for an important imperative to always create a great contrast. Black Pearl Granite seems like a pitch black stone when looking from afar. However, when you take a closer look, you’ll see that it’s rich with many burgundy speckles, brown shapes, and gray veins. Take a look at Black Pearl Granite countertops for only $44,99 per sq ft.
White granite countertops are the next all-time favorite kitchen countertop. White color will open up your kitchen space and also create a focal point. 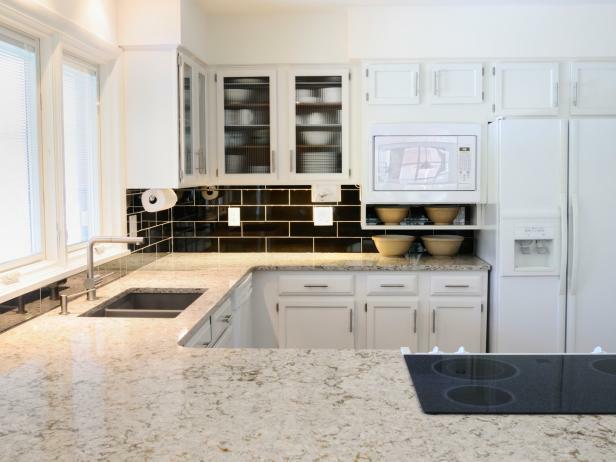 A countertop like Bianco Antico Granite will be hard to overlook. This is one of the most luxurious countertops. It is mostly white. However, it features a soft gray background and beautiful warm pink and taupe flecks. Take a look at Bianco Antico Granite price of $54.99 per sq ft is hard to beat. Our showroom in Wayne, NJ will meet your needs and give you an option for any granite color. 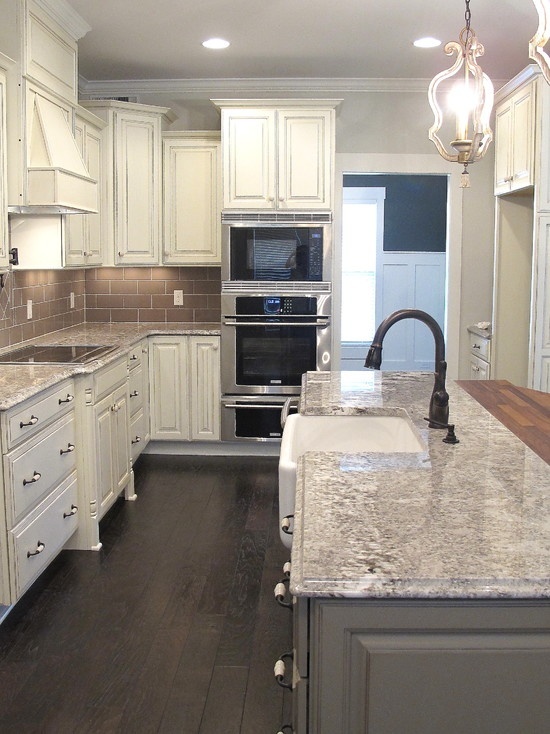 Granite color countertop selection is a breeze with our help. Feel free to evaluate your options below. After you choose the perfect granite slab, select the right sink. Most people select stainless steel sinks that are mounted underneath the slab. Stainless steel sinks are available in 16-gauge and 18-gauge options. 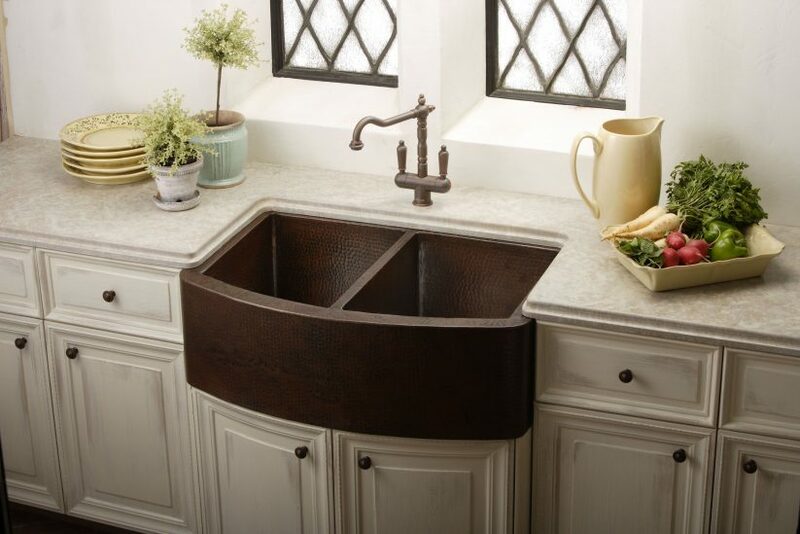 The 16-gauge sink is slightly more solid than the 18-gauge sink, making it resistant to depressions. You can choose from a variety of different shapes and sizes depending on your needs. Think about whether you prefer a wider, shallower sink or a deeper pool. Do you need two sinks that sit side by side or do you prefer one large area? 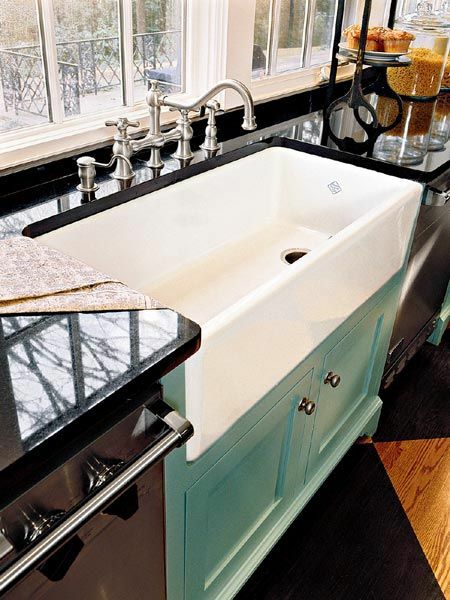 Take all of this into consideration and select the best sink for your needs and style. Please note that you will get a free stainless steel sink if you opt for our granite countertop deals. Sometimes, simply selecting the style of the countertop edge can be the most difficult decision to make. A square edge shows off the standard thickness of the granite, while a mitered edge makes the granite appear thicker. An eased edge is slightly smoothed, and a bullnose edge is very rounded at all the edges – perfect for traditional kitchens. Another traditional shape is ogee edge. It looks great on an island for example and contrasted to a more modern square edge on perimeter walls. On marine edge – the outside edge is raised. Other edge variations are more decorative and add to the price of the countertops. 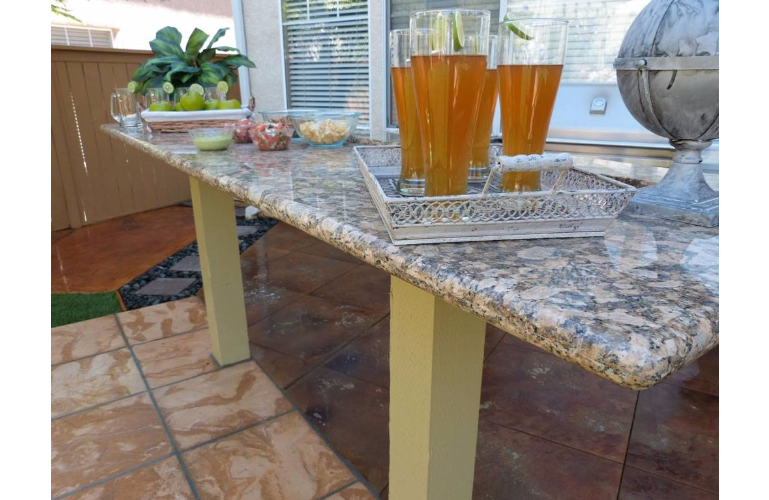 Please note that Aqua provides a free edge treatment when you opt for one of our granite countertop options. 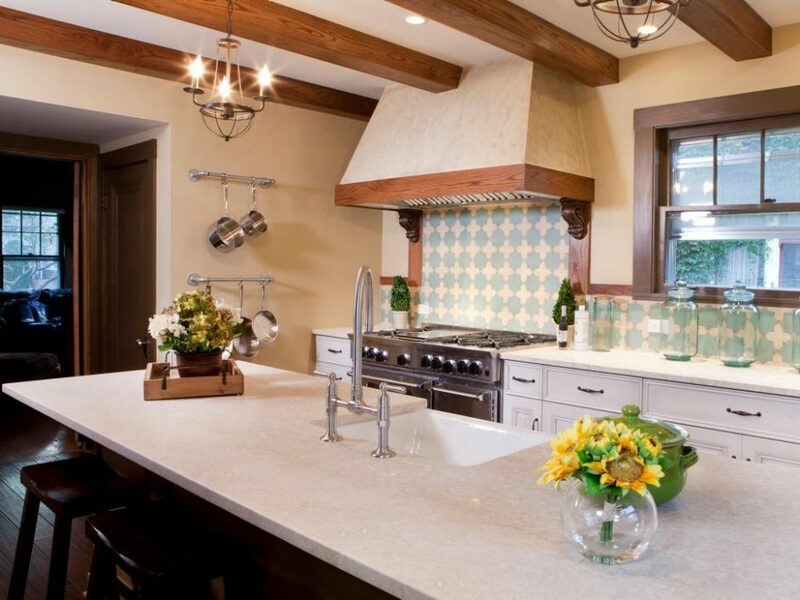 Choose whether you’d like a granite backsplash or not. 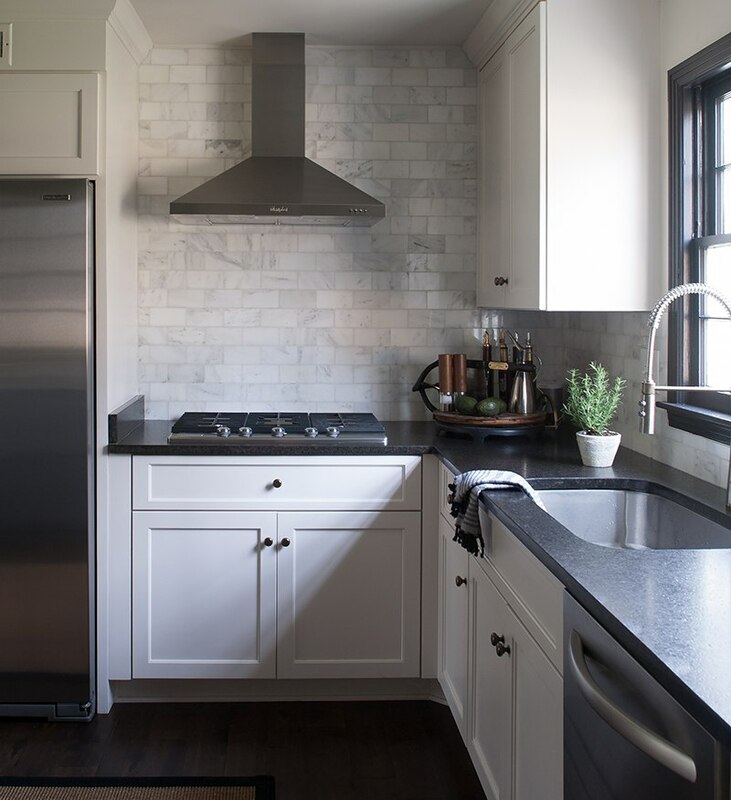 Usually, customers select a 4-inch backsplash, but many decide to eliminate the backsplash in favor of tile from countertop to cabinets. 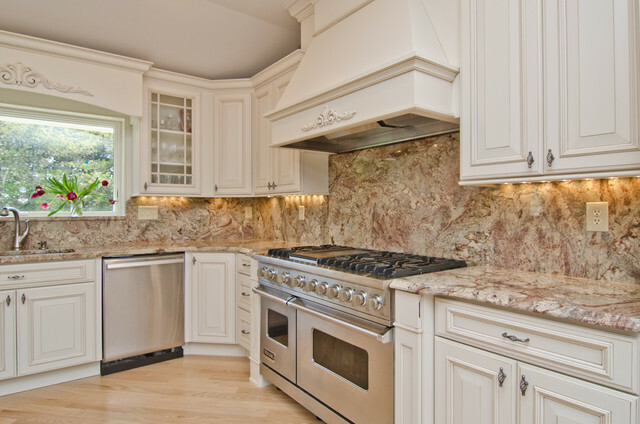 Granite backsplash is not difficult nor costly to install. It will protect the countertop and backsplash area from the moisture and create an amazing feel of class and elegance to your kitchen, too. A smooth, consistent look is guaranteed when you install the same granite as a countertop and a backsplash. After you select your slab, the sink and decide on the backsplash, the experts at Aqua will come to your house to layout the template. Make sure to specify then how many holes you’d like in the granite. The specialists may need to view the exact specifications of your faucet, soap dispenser and sink. 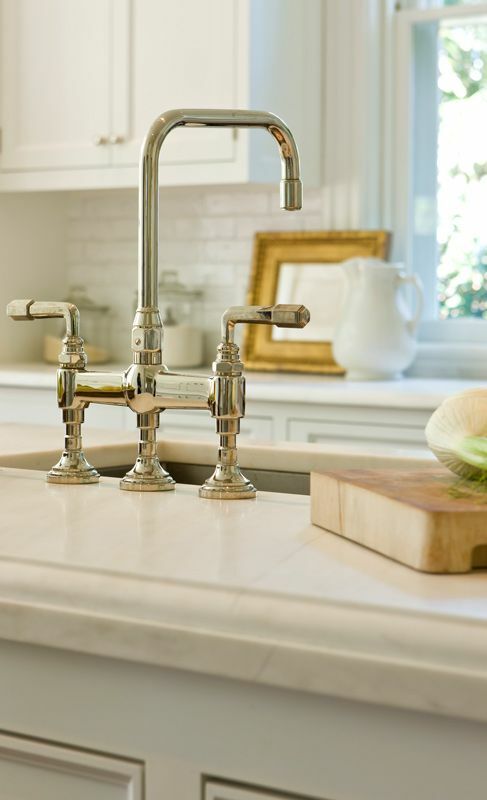 You need to decide is your faucet going to be a single handle or double, a countertop or wall-mounted. 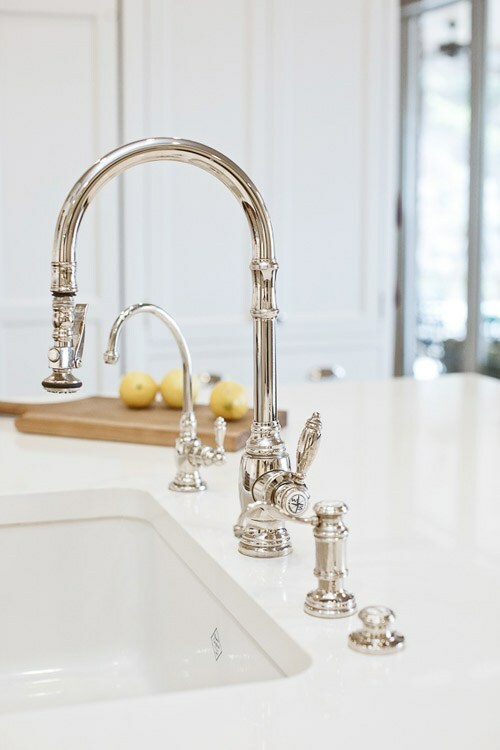 You also need to think about the size of the faucet and think if you need some special features like pull-out or side sprayers or motion-sensing. 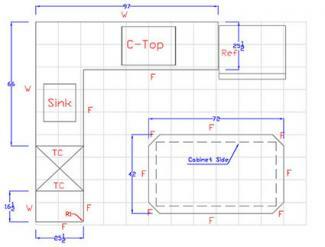 When you decide on a faucet, you are ready to start planning the template. The fabricators at Aqua will come to your house and create an exact template for your layout from wood. Expect to be available while the fabricators are creating the template. They will discuss with you the location of the seams, sink, and faucet. They will also help you decide on the overhang width and corner radius. At this point, make sure you ask any questions that come to mind. Once the template has been created, you can choose which part of the slab will be used for the project. You will be able to select the exact area of the granite to use for your countertops. Although this takes more time, you’ll be able to truly customize the look of your finished countertops. You can see where the seams will join up and discuss the best solution for attaching them. Granite countertops cost will range depending on the quality of the slab and how common the type of granite is. Adding custom edges and cutouts will increase the price. Make sure to ask if there are any scrap pieces from which you can choose. This can help you save money on the granite so you can spend more designing the edge or selecting a faucet. Installing granite countertops with the price of the granite material included, could cost on average $3,100 and go up to $4,000 or more, depending on your wishes, according to the $34,99 per sq ft installed. This is an amazing offer that can save your budget and enable you to get the best quality without breaking the bank. The first step is to stop by and choose the stone color, edge profile, and other options. We carry premium quality materials and have 1000 slabs in over 100 colors in stock. You can get granite countertops with free installation, free estimate, free sealer application, and free edge treatment starting at $34,99 sq ft based on 35 sq ft kitchen. The priciest deal is – $54.99 per sq ft installed – $2,124. See all of our granite deals that you can get. We will complete the fabrication of your countertops within one week. After they have been cut and shaped, the granite pieces will be installed in your kitchen or bathroom. Installation in a typical kitchen will take a few hours, and more time is necessary to install countertops in a large kitchen or a complex layout. The faucet and sink drains can usually be installed after 24 hours. 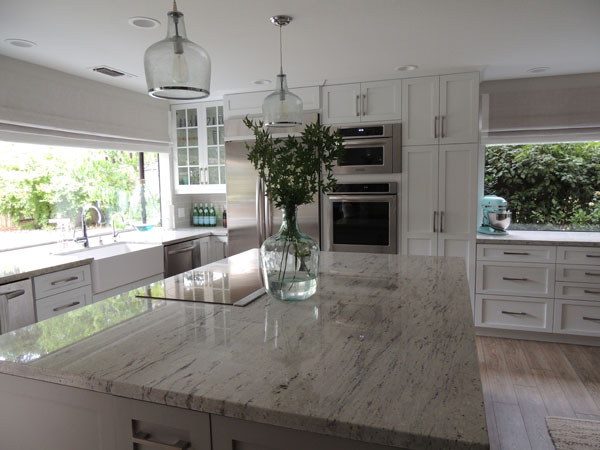 The specialists at Aqua Kitchen and Bath Design Center serve homeowners in the Wayne, Franklin Lakes, North Caldwell and all other areas in the state of New Jersey. We also provide the same services and products for the neighboring states. All aspects of creating granite countertops, from helping our clients select the perfect stone for their décor to consulting in regard to the design and fabricating the piece, will be taken care of with us. 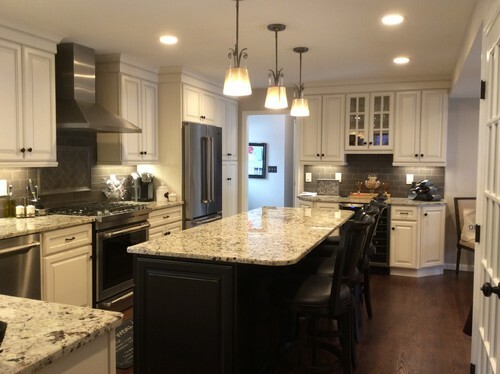 We pride ourselves on creating a relationship with clients so we can better understand their needs and provide them with the luxury granite countertops they’ve always dreamed of. Contact us today and start planning your dream kitchen with us.